Elon Musk teased a number of new features for his SpaceX rockets and the technology that launches them. First up is the new x-wing design for hypersonic control, which help with re-entry to improve stability and offer greater maneuverability. For take-off, the fins are stowed and automatically deploy for re-entry. Musk’s reusable rocket program has been in development since at least 2012 and has been largely a success. Back in August, a Falcon 9 test rocket exploded during launch but didn’t cause any injuries. 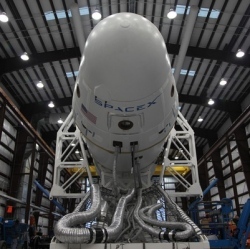 The next SpaceX Falcon 9 launch is scheduled for 16 December 2014 on a resupply mission to the International Space Station.